When you’re hanging out in Greece with Valentino Garavani and Giancarlo Giammetti, you’d better look stylish. Of course, Olivia Palermo’s outfit in an Instagram snap of just such an occasion more than fits the bill. In it, she teams a feminine, ruffled off-the-shoulder blouse with Tibi’s Marisol Embroidered Appliqué Denim A-Line Skirt ($395), resulting in a perfectly vacation-ready look that screams island chic. You’ve probably seen denim miniskirts popping up all summer, from Bella Hadid’s Re/Done mini to the various ways street style stars have interpreted the trend. Given the ubiquity of minis, the midi length on Palermo’s Tibi iteration feels especially fresh right now. Plus, the colorful embroidery adds a fashion-girl twist that we’re crazy about. All in all, Palermo has officially inspired us to swap the denim miniskirt for an embroidered midi version for fall. Join us, won’t you? Scroll down to see Olivia Palermo’s full vacation look and shop her Tibi skirt! 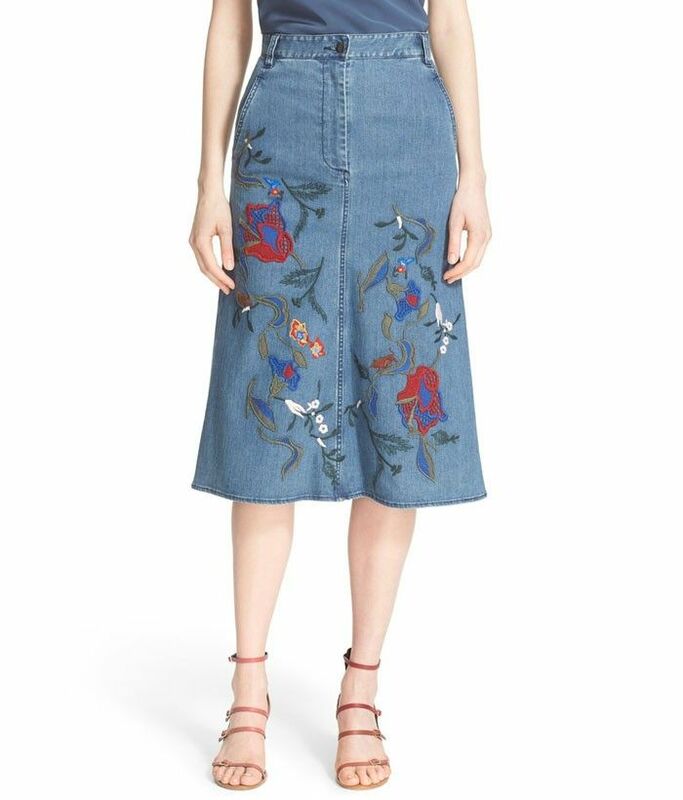 Would you wear an embroidered denim midi skirt? Tell us in the comments below, and then shop more affordable embroidered denim pieces at ASOS!